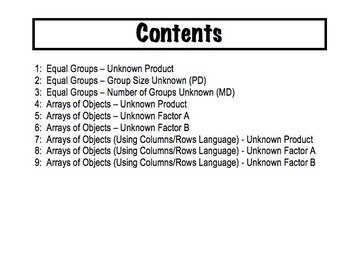 In this set you will find 10 word problems of each of the above types. That makes 90 word problems total. I use the first and last problem as a pre and post test to measure student growth, as well as to differentiate instruction. Instructions for how to do this are included! 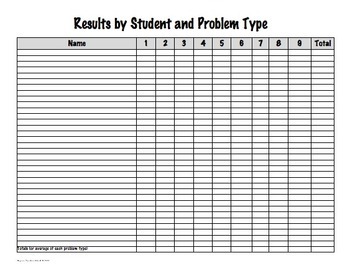 The problems are real world, are easy for students to relate to, and are kept simple on purpose. They are meant to introduce students to the concepts of multiplication and division, using vocabulary to help them use manipulatives and visualize strategies. 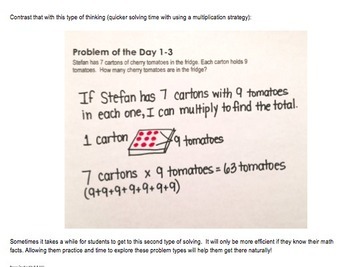 It allows for ample practice opportunities, and embeds math fact learning within the problems. 3. 90 word problems in three formats: two per page for easy printing as a booklet, several on a page for cutting and pasting into math journals, and full page problems to allow space for the use of hands on materials. 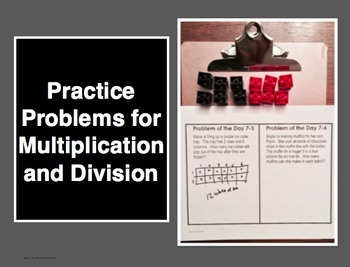 While the word problems are quite simple, they can still be challenging for students when they are first introduced to multiplication and division, and especially for students that struggle with learning these concepts. The problems are appropriate for third graders (and perhaps struggling fourth graders). Cognitively Guided Instruction (CGI) is a research based way of teaching problem solving. I use these daily for about a week. Then I introduce an open ended word problem that is much more difficult, complex and includes many steps. The open ended problems will often use multiplication or division AND include other concepts (fractions, decimals, area, perimeter) to challenge my students in other ways. Feel free to check out my open ended problems as well!